Droplets of a low-viscosity liquid experience partial coalescence when they are released from a relatively small height above the surface of a liquid bath. They merge with the bath, but coalescence is stopped before being completed. As many as 6 successive partial coalescences can be observed: droplets are really similar to russian dolls ! It all happens in less than a second though, so high-speed imaging techniques are necessary to catch the beauty. The same phenomenon is observed at liquid-liquid interfaces (e.g. for aqueous droplets in an oil phase) and considerably slows down the coarsening of emulsions. Even better, it works for soap bubbles too ! We have shown that droplets can bounce indefinitely on a vibrated interface, if they have the suitable size. What if they are too large, then ? Well… partial coalescence can surely help ! In the movie here above, partial coalescence is observed to be self-similar (at least for the three first events): the droplet radius gets divided by about 2 at each step. Said differently, ψ does not depend on Bond and Ohnesorge in this regime. One force, surface tension, dominates the others (gravity and viscosity). Partial coalescence stops to be observed when either the Bond or the Ohnesorge number becomes of the order of unity or larger. As the droplet gets smaller, the Ohnesorge number increases and the phenomenon stops being self-similar. Ultimately, the droplet completely coalesces with the underlying bath. Recently, F. Blanchette and coworkers have shown that partial coalescence was due to the convergence of capillary waves at the top of the coalescing droplet. When viscous effects become significant, these waves get damped and coalescence is not partial anymore. Colors emphasize the motion of the interface: blue = advancing, red = receding. With liquid-liquid interfaces, things get a bit more complicated. Now, there are two viscosities to take into account: the liquid from the drop (1) and the surrounding liquid (2). Although both do damp the capillary waves equivalently, they also affect the microflows inside and outside the droplet in a very different way. 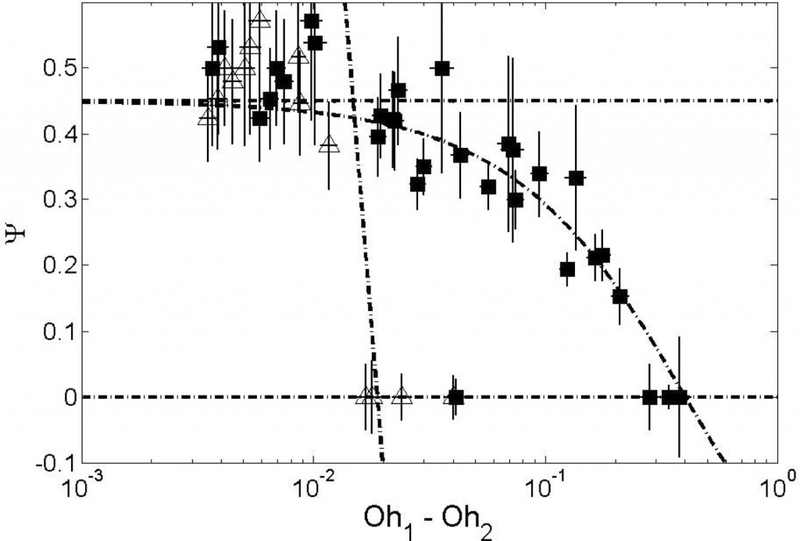 As a consequence, the function decreases very sharply with an increase in Oh1 (triangles in fig. below) while it decreases more smoothly with an increase in Oh2 (squares in fig. below).